A growing number of Koreans in their 20s and 30s are turning their small studio apartments into cozy nooks. More people are sharing photos of their home interiors on social media platforms, showcasing carefully decorated rooms. 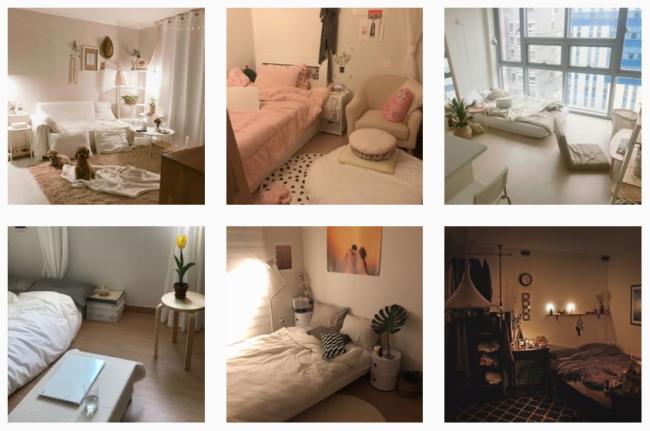 A search of the hashtag “ja-chi-bang,” a Korean word for small studio apartments where people live alone, on Instagram found over 180,000 posts. The photos depict snug, warmly lit spaces usually consisting of either a single bed, a desk or a small kitchen space. The decorations are not luxurious but minimal and intimate. 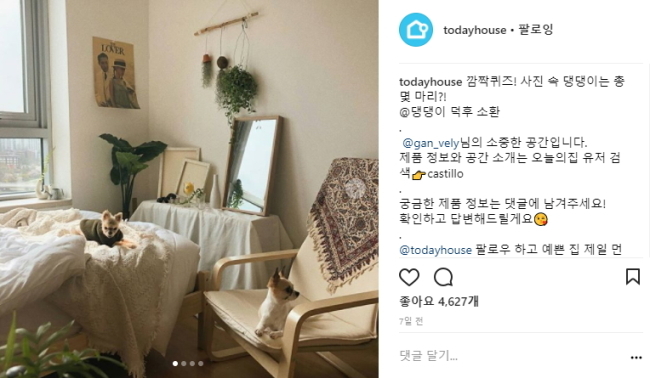 The Instagram page Todayhouse, which shares submitted photos of artfully decorated studio apartments around Korea, has over 446,000 followers. Many of the submitted photos show home theaters that use projectors on walls or small home-cafes, consisting of one tiny table with magazines, flowers and coffee. More online users have been seeking information on self-decorating recently, according to Lee Seung-jae, CEO of Bucketplace, an app where users share photos of home interiors and gain inspiration. “The number of photos shared have surpassed 100,000, and numbers are growing at a faster pace,” he said. Experts say that a change in the priorities of younger generations is the main reason behind the growing interest in home decor. Older generations of Koreans valued hard work and persistence, while the current generation strives for well-being in their lives, according to Kwak Geum-joo, a professor of psychology at Seoul National University. “Today’s youths prioritize benefiting from life and enjoying what it has to offer. They have a strong tendency to value comfort and coziness,” she said. The enthusiasm for turning small rooms into pleasant spaces also reflects the faltering economy, reports say. As younger generations find it increasingly difficult to afford large houses, they are instead making the most out of their small living spaces. This phenomenon has birthed the concept of “fast furniture,” or affordable household items that can be easily replaced with changing trends, according to reports.